Every year, millions of patients suffer bone fractures and a proportion of these heal improperly, resulting in pain and loss of function. Fibrin matrices form at the fracture site and are thought to support the early stages of bone formation and repair. However, excess fibrin accumulation impairs wound healing and was recently shown to promote inflammatory osteoporosis in mice. Masato Yuasa, Nicholas Mignemi, and colleagues at Vanderbilt University Medical Center determined that fibrin deposition is not required for fracture repair, but clearance of fibrin is critical for the healing process. Specifically, fractures healed normally in mice deficient for the fibrin precursor fibrinogen, as callus formation, strength, vascularization of the healing injury and remodeling at the fracture site were the same as observed in WT animals. Conversely, plasminogen-deficient mice, which lack plasmin-dependent fibrin removal, exhibited heterotopic ossification and delayed fracture repair, as well as impaired callus formation, remodeling, and vascularization. Loss of fibrinogen reduced fibrin deposition, largely restored normal fracture repair, and limited heterotoptic ossification in plasminogen-deficient mice, confirming that the repair abnormalities in these animals were dependent on the fibrin clearance function of plasmin. Furthermore, Yuasa, Mignemi, and colleagues determined that fibrin localizes between the soft and hard tissue callus, suggesting that fibrin matrices inhibit fracture repair by physically impeding cell migration. The results of this study reveal that efficient fibrinolysis promotes bone fracture repair and vascularization. 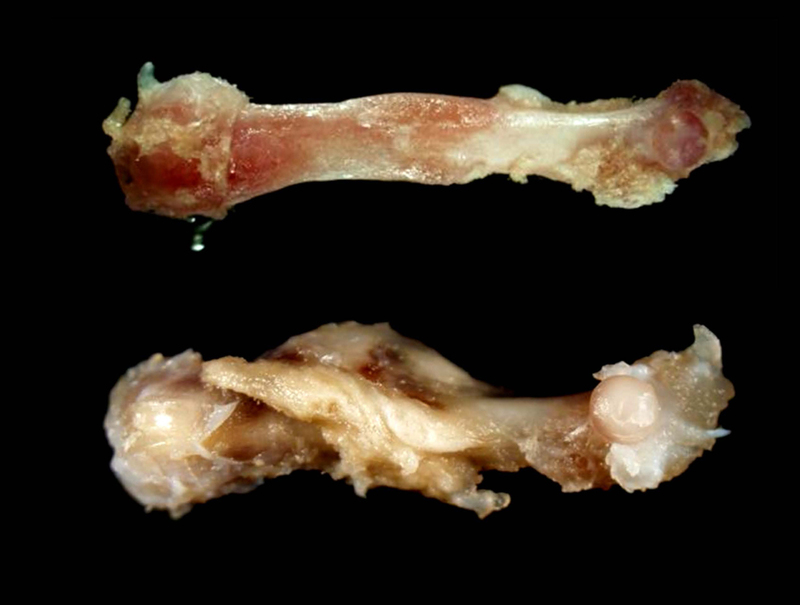 The accompanying image shows femurs from WT (top) and plasminogen-deficient (bottom) mice after fracture and repair. Note the excess bone formation outside of the injury site (heterotopic ossification) in the plasminogen-deficient animal. Citation Information: J Clin Invest. 2015;125(8):3117-3131. https://doi.org/10.1172/JCI80313. Bone formation during fracture repair inevitably initiates within or around extravascular deposits of a fibrin-rich matrix. In addition to a central role in hemostasis, fibrin is thought to enhance bone repair by supporting inflammatory and mesenchymal progenitor egress into the zone of injury. However, given that a failure of efficient fibrin clearance can impede normal wound repair, the precise contribution of fibrin to bone fracture repair, whether supportive or detrimental, is unknown. Here, we employed mice with genetically and pharmacologically imposed deficits in the fibrin precursor fibrinogen and fibrin-degrading plasminogen to explore the hypothesis that fibrin is vital to the initiation of fracture repair, but impaired fibrin clearance results in derangements in bone fracture repair. In contrast to our hypothesis, fibrin was entirely dispensable for long-bone fracture repair, as healing fractures in fibrinogen-deficient mice were indistinguishable from those in control animals. However, failure to clear fibrin from the fracture site in plasminogen-deficient mice severely impaired fracture vascularization, precluded bone union, and resulted in robust heterotopic ossification. Pharmacological fibrinogen depletion in plasminogen-deficient animals restored a normal pattern of fracture repair and substantially limited heterotopic ossification. Fibrin is therefore not essential for fracture repair, but inefficient fibrinolysis decreases endochondral angiogenesis and ossification, thereby inhibiting fracture repair.